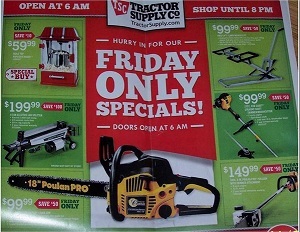 Tractor Supply Black Friday deals, November 29 between 6AM and 8PM: $199.99 Earthquake electric 5 ton log splitter, 2300 PSI, CARB compliant; $99.99 Poulan Pro PP 5020 AV 20 in. chainsaw; $69.99 AmeriHome tabletop popcorn popper; $99.99 pro-lift lawn mower lift; $39.99 Hobart Auto Arc explorer series variable shade auto-darkening welding helmet; $149.99 JObSmart 1-1/2 HP 26 gallon oil lubricated vertical air compressor; $19.99 JobSmart 500 lumen rechargeable spotlight; $299.99 Simpson Mega Shot Gas 3100 PSI 2.5 GPM Honda GC 190 engine pressure washer; $699.99 Cannon TS6060 wide body safe; $19.99 Itasca ladies’ The Vermont boot; $119.99 ClassicFlame, infrared quartz heater in walnut, CARB compliant; $29.99 Carhartt lined mens zip front hooded sweatshirt; $499.99 Baja motorsport mini bike; $99.99 Charlog bench w/ storage; $19.99 PEdigree Adult complete nutrition dog food; $59.99 RedStone ash vacuum cleaner; 50% off retriever single door dog crates; $59.99 AmeriHome Old Fashioned ice cream maker; and more. 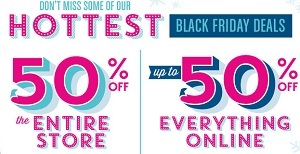 Check all Tractor Supply Cyber Monday 2013 deals and sales on tractorsupply.com.